Windy. Cloudy skies will become partly cloudy this afternoon. Slight chance of a rain shower. High 74F. Winds WSW at 20 to 30 mph.. Rain showers early will evolve into a more steady rain overnight. Low around 45F. Winds WSW at 10 to 20 mph. Chance of rain 70%. Rainfall near a quarter of an inch. 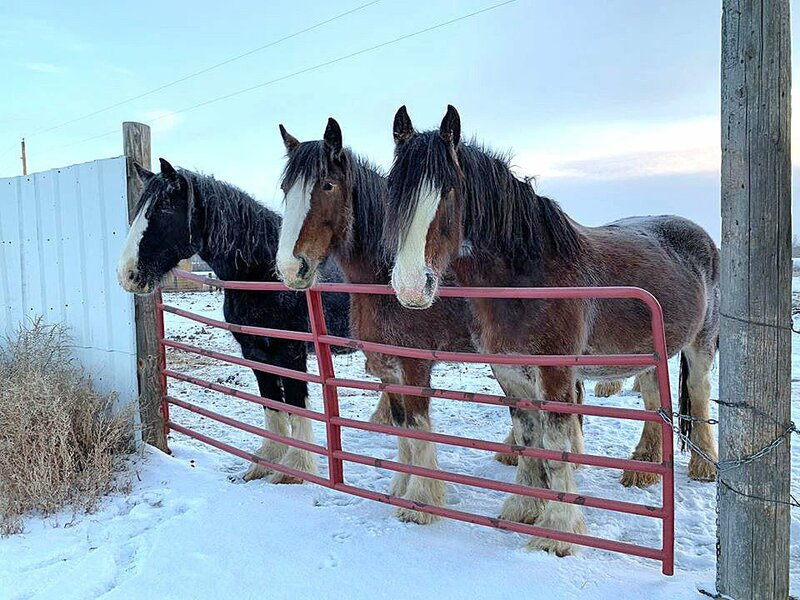 The Hoaglands, who own Big Sky Shires and Equine Services, near Glendive, own these draft horses, along with a lot of other animals. The horses greet visitors as they come by. The horses greet visitors as they come by. This ewe just had a lamb, who Leanne put in a blanket. The upside down barrel for the lamb with a heat lamp is next to the pair. The Hoaglands son, Connley, shows his sheep at the fair. GLENDIVE, Mont. – Take a look around this snow-topped ranch where draft horses gather at the fence, and baby lambs are born inside the nice barn – starting life inside upside-down recycled barrels with heat lamps to make it warm and cozy and the mommy ewe nearby in the jug. “Oh, Duchess is coming up and she goes right by me and turns so she can have a belly rub. That what she likes,” said Leanne Hoagland, at the draft horse pen. This is Big Sky Shires and Equine Services, a unique ranch outside Glendive in eastern Montana. Leanne and Brett Hoagland built this multi-animal operation almost from scratch. Here they raise registered and commercial Hampshire sheep, draft horses, quarter horses, a few goats with bells, and mini Aussie dogs for working dogs on ranches. The couple has a son, Connley, who is 12 and helps out as much as possible on the ranch. He is in 4-H, and raises lambs for the fair. Leanne is a 4-H leader, as well as an FFA teacher and ag education instructor. In addition, Leanne offers online instruction in many horse education courses, such as nutrition for horses. In one large pen, beautiful draft horses with white manes and thick white hooves eat in a special net feeder, which keeps their nutrition and energy up. Monty, Lacey, Bug, Duchess and Jazz are some of their draft horses. Leanne was born in Browning, Mont., and is a descendent of the Blackfeet tribe. Her parents moved around a lot, and her dad, John Pfizer, started the ag program in Hysham, and finally settled in Roundup as the Extension agent. Now he is a regional director for Montana State University Extension. “When my family raised horses, we raised quarter horses, and later, kept saddle horses,” she said. When she was a teen in Roundup, Leanne worked on the G-7 Bar Ranch. “At one time they ran over 1,000 sheep and that is how my interest started in sheep. I enjoyed the sheep and loved the lambing. We fixed fence, farmed hay and raised cattle,” Leanne said. She went to three years at Northwest College in Powell, Wyo. As a student, she worked in the lab as a meat lab technician and judged horses on the collegiate level. She competed at the 1997 World Quarter Horse show, with the team garnering the reserve championship, and Leanne finishing fifth. Leanne finished her bachelor’s in ag education at MSU. At MSU, she competed on the Intercollegiate Horse team. Then Leanne went on to receive a master’s degree in ag business at Kansas State University. She met Brett in Bozeman at MSU. Brett graduated with a degree in pre-veterinary science and wildlife biology. When they arrived in Glendive 13 years ago, they bought the Big Sky ranch for sheep and horses and leased some acres, too, for hay for the horses in the summer. Brett started as a sheriff, but has been recently promoted to detective at the sheriff’s office in Glendive. Leanne is currently teaching ag education and welding at Dawson High School. This is her first year, and she formerly taught at Dawson Community College. In addition, Leanne is a certified addiction counselor, and they use the horses as equine therapy certified through the EAGALA (Equine Assisted Growth & Learning Association) program. Leanne explained how equine therapy helps. When Leanne and Brett were not working off the ranch at their jobs, they built the ranch up to the nice, efficient buildings and pens the ranch has today. They did all the work themselves with help from their sons. “We built everything paycheck to paycheck and are proud of what it is today,” Leanne said. When they arrived at the ranch, it was really just a machine shed and one-third of a barn. They built two-thirds of the barn, adding recycled tin to the roof. In addition, they built ram runs and pens for the horses and sheep, including a special space and individual pens for the large, registered rams. “We have recycled a lot of material. The railroad tracks that run in front of us sold us railroad ties when they came by to do track maintenance,” she said. They bought new feeders for the sheep, which they really like. They also have mineral and salt tubs. Inside the barn, the sheep started lambing last month. “We’ll have 50 head total this month,” Leanne said. Inside the barns, they have jugs for the ewes that are lambing. There are cameras in the barn so they can check on their lambing on their computers and phones. The ewes have their lambs in little pens, and the lambs are placed in the bottom of turned-over recycled barrels Leanne bought the railroad. “We tie the barrel to the back of the stall so the ewes won’t knock 'em over. They cut out a hole for the lamb and heat lamps are in every jug. Straw is placed in the bottom, and the lambs stay warm,” she said. Brett hunts in Africa, and the big wood crate boxes that are sent from Africa are used for little pens in the barn. “All the ewes and lambs eventually go in one pen, out of giant plywood boxes,” Leanne said. When they are little, the lambs are put on creep feeders as soon as willing to eat some grain. “We wean at eight to 10 weeks,” she said. Connelly picks out whatever sheep he wants to raise for fair, and some are raised as replacements. Some are custom-fed for people, and the rest are raised as market lambs. “We are selling lamb at the local Dawson County Extension food to table market,” she said. The sheep are sheared after lambing because they lamb early and they want the ewes to keep their wool to stay warm. Duchess is due to foal this month, and Glory is also due to foal. Leanne watches Monty play in a pen with a sheep. The sheep would run with Monte to the end of the pen and Monte would turn around and chase her. Monte tires and watches over the fence. In another video, the two Aussies, Eddy and Chevy bring the sheep into the barn with ease. Leanne maintains a Facebook page that is very interesting and has many videos to watch. Big Sky Shires had a booth at the Glendive GATE show this year. Glendive-area farmers and ranchers and townsfolk stop by their booth to check out their products. Leanne offers a full-service equine facility, specializing in producing Shire horses, offers clinics, lessons and overnight boarding. Leanne is certified with the American Riding Instructor’s Association (ARIA) in Level II Western, Reining and Level I Hunt Seat, driving. Leanne also has attained her Equine Breeding certificate through Colorado State University. She continues lessons and clinics in driving, reining, pleasure and English riding. Check out Leanne’s Facebook page (https://www.facebook.com/BigSkyShires) to find out about courses and watch videos of life on their ranch. For more information, call Leanne at (406) 687-3004.